The new Collabor88 collection from The Sea Hole is irresistible. 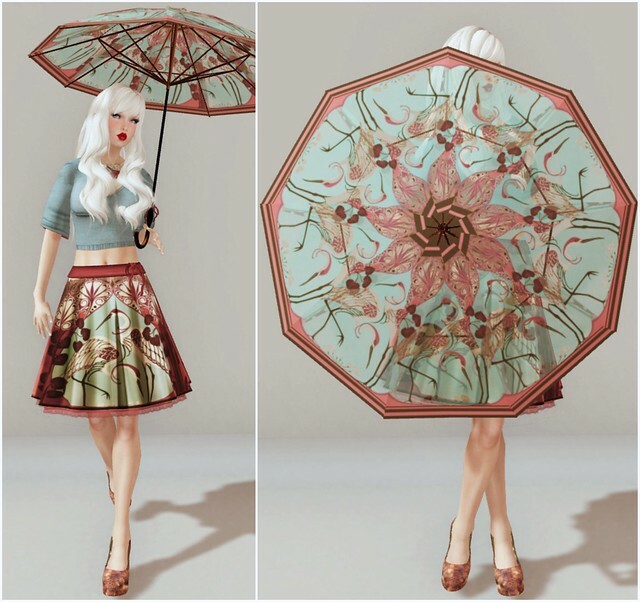 I’m a sucker for a nice parasol, and there are several prints to choose from! There are also matching skirts & tops to choose from, but you can also mix-and-match them. My only gripe about this parasol is the built-in Umbrella Hold animation does not have a closed fist, so it looks kind of weird when holding the umbrella with the hand being completely spread. Nevermind! I’ve just discovered that MY pose overrides the hand animation in this, oops! I’m wearing the matching Minna Blouse, and Heron Skirt, both in Dusted color. I’ve noticed that the skirt is NO MOD, even though in my inventory, the skirt prim is (no transfer) and the pants is (no copy). The top also has (no transfer) sleeve prims and (no copy) top texture. I wonder why The Sea Hole chooses to have mixed perms? It’s so confusing. Can I make copies of this outfit? Or can I give it away? But neither is possible due to the mixed perms! I wouldn’t have worn this outfit at all, if I didn’t like the parasol so much. The skirt prim is one sculpted attachment, it doesn’t move very well in some poses, and also since I couldn’t mod it, I had to mod my body to fit. Despite all of the ‘flaws’ the whole look together is nice if you can make it work. I think the parasol makes the outfit. I do like the textures. Perhaps the odd perms are due to the perm changing bug. It’s no perm bug. The Sea Hole always uses mixed perms, part of the outfit transfer and other parts copy. I don’t understand the choice either and it would be interesting to hear her reasons. They are lovely clothes of course and the style is great. I wish she sold buildings too, her shop is so unique. You don`t think the ‘parasol’ is too big? Maybe I`m too small but I wish I`d been able to mod it a little. I look like a little girl with my mummy’s umbrella 🙁 But it *is* a lovely pattern all the same. Thanks GoGo.. I am glad that I didnt buy the that last night. I hate when the perms are all messed up and I hate having to change my shape and not be able to change the clothes. Prim clothing items that are neither modifiable nor have a resize script is just unacceptable really. And as for mixed perms, that just seems crazy. Honestly, honestly, honestly? I think those new Milana Hairs (just like her very similar ones from Dernier Cri, Dove…) look like wigs. They don’t look like natural hair at all but rather like wigs you’d wear to a theme party. 🙁 Very odd headshape.